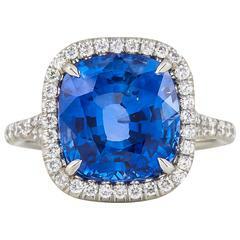 This remarkable 4.67 carat natural, unheated Burma blue Sapphire, is set in a very unique 6 claw prong, split shank platinum diamond ring, displaying spectacular greenish grey undertones.. This AGL certified, ultra exclusive Sapphire, is superior in cut and clarity and is out of reach for the average consumer. 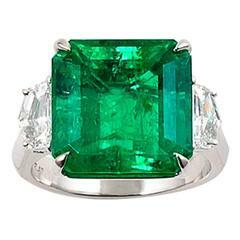 Merkaba Jewelry caters to the world's most avid gem collectors. 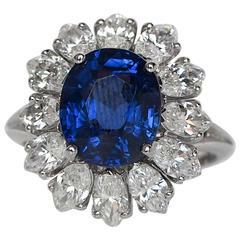 Specifications: Burma Sapphire - 4.67 carats, cushion shaped Round Brilliant Diamonds - 0.90 carats total Platinum Size 6. Resizing is complimentary upon request. AGL certificate attached Crafted by extremely skilled hands in the USA. ***Returns are accepted within 7 days of delivery and will gladly be paid by us. Rings resized upon request, may also be returned.